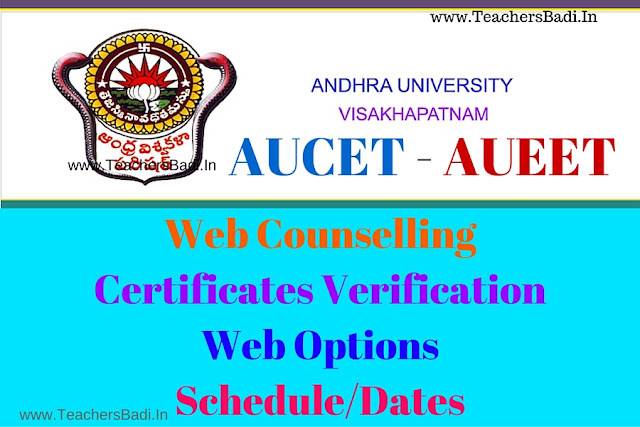 AUCET/AUEET 2018 Web counselling, Certificates Verification Schedule 2018, Web Options Schedule, AUCET/AUEET 2018 Web Options Schedule, Counselling dates,Certificates verification process dates are announced. Guidelines for Certificate Verification, Counseling and Web Options Entry/ Guidelines for Certificate Verification, Counseling and Web Options Entry in Telugu: Andhra University had issued AUCET 2018 notification on ................. February, 2018 and online applications were invited from the candidates who have passed or appearing for the final year examination in the qualifying degree for admission into Post Graduate courses as listed in its website (www.audoa.in) leading to Post-Graduate degree in M.Sc., MA., M.S.W., M.Com., M.H.R.M., M.Ed., M.P.Ed., PGDAS., P.O. Diploma in Yoga., 5 Years Integrated Courses in M.B.A. and Nanotechnology for the Academic Year 2018-18 offered by Andhra University Campus. PG Centre, Vizag and its Affiliated Colleges through AUCET-2018. AUEET 2018 is a common entrance as Engineering Entrance Test (AUEET-2018) notification had been issued and online applications were invited for admissions into (A) 6-Year (B.Tech. + M.Tech.) Integrated Degree Programmes in CSSE, Computer Science & Networking, Civil, Mechanical, EEE, ECE, Chemical, Instrumentation Technology and (B) Twinning Programmes (B.Engg. Aircraft Engg and B.Tech. Electro Mechanical/ Chemical/ Electronics) through AUEET-2018. AUCET adn AUEET 2018 were conducted as per schedule and after results/rank cards were declared. Now, AUCET/AUEET 2018 web counselling-web options-certificates verification detailed dates(Schedule) were released in May 2018. So, candidates should attend the certificates verification process with the required following certificates at given Helpline centers. 2 Manual Admissions for NCC and CAP categories at Visakhapatnam (Directorate of Admissions Office) ..... May, 2018 9.00 A.M.
3 Manual Admissions for PH and Sports categories at Visakhapatnam (Directorate of Admissions Office) .... May, 2018 9.00 A.M.
4 Manual Admissions for NSS categories at Visakhapatnam (Directorate of Admissions Office) .... May, 2018 9.00 A.M.
5 Certificate verification at four (4) Helpline centers : Visakhapatnam, Srikakulam, Kakinada & Vijayawada ..... June, 2018 9.00 A.M.
10 2nd Phase of Certificate verification at four (4) helpline centres ..... June, 2018 9.00 A.M.
15 3rd Phase Admissions ..... June, 2018 onwards details will be announced. date and time at any of the notified helpline centres with all the following certificates and registration fee Rs. 500/- ( Rs.250/- for SC/ST/PHC). 3. Statements of Marks and Provisional Certificate / Original Degree. 4. Transfer and Conduct Certificates from the institution where the candidate last studied. 8. Latest Income Certificate issued by the competent authority (valid for 4 years) or white ration card in case of eligible SC/ST/BC/EBC candidates claiming fee concession. Note : 1) Third Phase of admissions shall be conducted manually at the Directorate of Admissions, Andhra University, Vijayanagar Palace, Pedawaltair, Visakhapatnam after the two phases of online web counseling. 2) The conversion of seats under reserved categories shall be done only in Third Phase. 3) The detailed schedule of Third Phase shall be displayed in websites : www.andhrauniversity.edu.in/doa and www.audoa.in after completion of 2nd phase.